If you are in search of a high-quality bread maker, Red the bread maker review of this Breville BBM800XL Custom Loaf Bread Maker. It will not disappoint you! You have to agree – nothing tastes as good as freshly baked bread. However, sometimes your favorite bakery is closed and you are left with cold and preservative-packed bread from the store. Are you ready to take a step towards making your own healthy and tasty bread? If your answer is positive, the next question that stands on your way is how to choose the best bread machine? Before buying a bread maker for your kitchen, there are so many important things to consider. You need to think about the desired size and shape of bread, and you need to take into account the pre programmed settings you want to see in your future bread machine. The research might take some time – but don’t worry! We have already done the tough part of the job for you. We have researched the market and spotted the most popular and reliable bread machines available on the market. Today, we will discuss the key highlights of the Breville BBM800XL Custom Loaf Bread Maker. This award-winning bread maker produces bread in four different sizes (1, 1.5, 2 and 2.5 pounds sized loafs), and it has three different settings for crust darkness. The bread machine from Breville features an automatic dispenser for adding fruits or nuts, so they get added to the dough at just the right time. The kneading paddle in this Breville BBM800XL is collapsible. There is no need to remove the paddle before the baking cycle, as the paddle will fold to minimize the hole left in the loaf. The model also comes with the non-collapsible paddle for making jam. Following on the great settings of this bread machine, it is necessary to mention its 13 automatic settings and 46 great step-by-step recipes for the huge variety of bread and other foods. The Breville BBM800XL Custom Loaf Bread Maker was designed with the greatest standards of the bread machines market in mind. This bread maker will satisfy the needs even of the most demandable customer. With Breville BBM800XL, you can make basic white bread, whole wheat bread, gluten-free bread, crusty loaves, sweet bread, yeast-free baking, dough only, jam, and a number of other great things. That’s not all! You can custom your own programs – Breville lets you get creative. In addition, this bread maker has a delay timer option, which is perfect for those, who love to eat freshly baked bread in the morning. Breville BBM800XL’s working process is very quiet, so you can bake your bread during the night. When it comes to the intuitive controls, Breville bread machine definitely delivers. It has a smart LCD screen that features a progress indicator. In order to see the full and honest picture behind the product, it is always recommended to read customer testimonials. We followed this rule while evaluating this Breville BBM800XL Custom Loaf Bread Maker. Owners of this bread maker stated that the appliance is capable of baking perfect loaves of bread. The reviews were stressing the usefulness of the nut and fruit dispenser – it is so easy to bake bread with some tasty extras! 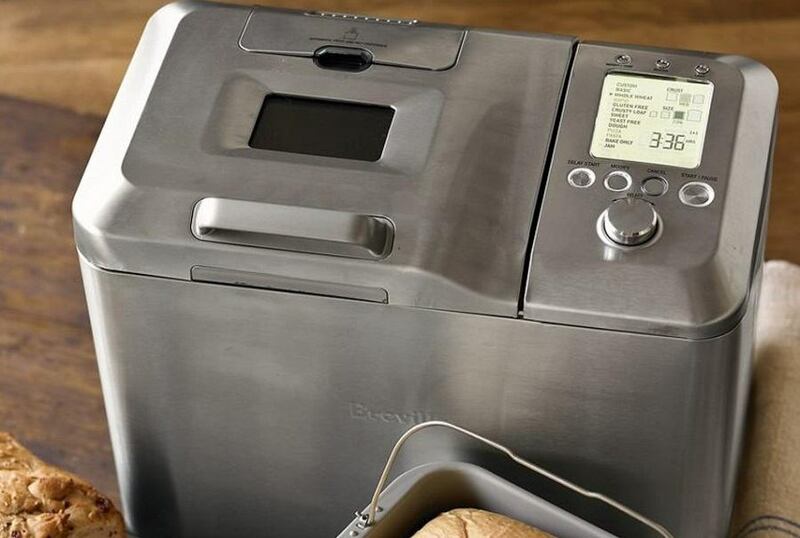 One of the most mentioned features of this Breville BBM800XL Custom Loaf Bread Maker is a crusty loaf cycle – customers love this function and say that bread comes out just the way they like it. Another interesting feature that is favored by Breville BBM800XL Custom Loaf Bread Maker owners is a built-in light, which allows them to check on the loaf without opening the lid. The customers also said that the machine lets you save money in the long term – and, it also allows you to control what you eat, which is a great advantage for people with allergies or for those, who try to cut on some of the components. In case you want to purchase this Breville BBM800XL Custom Loaf Bread Maker, you will need to know some additional information in advance. 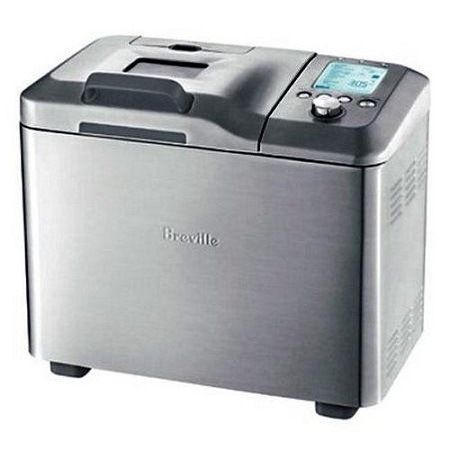 Breville provides a limited 1-year warranty for this bread maker. The producing company warrants this item against defects in workmanship and materials. After having looked through a number of appealing offers on the Internet, we have stumbled upon Amazon. The deal has appeared to us as the most beneficial in terms of the price/value ratio. 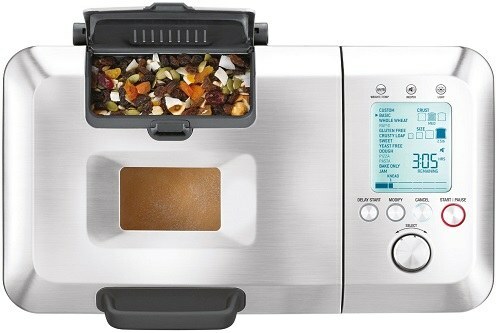 Currently, Amazon is offering this Breville BBM800XL Custom Loaf Bread Maker for just below $230 with free shipping. This great price includes a $20 discount – but the offer is limited, so we recommend hurrying up if you want to get this item. Free shipping implies that your order will be delivered 5-8 business days after all your items are available to ship, including pre-order items. Breville BBM800XL Custom Loaf Bread Maker is one of the most popular and trusted models of bread machines on the market. It bakes bread in four different sizes, while the model has 13 automatic settings and 46 great step-by-step recipes. 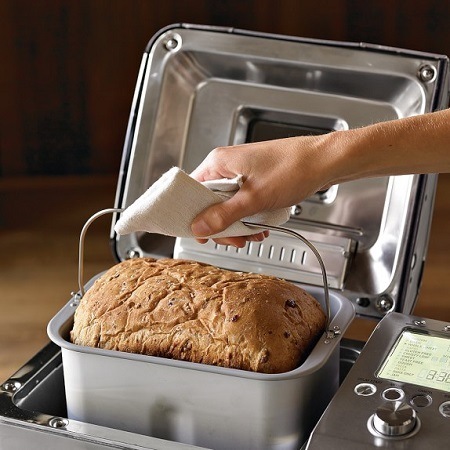 Aside from all the benefits provided by this bread maker, you can get it for almost no price! We would definitely suggest buying this bread maker – it will serve you a good time.